This might be Boston's deepest, best front court rotation since it was anchored by Kevin Garnett. And, of course, it ought to be - this is a team with designs on a banner, after all. But with the much-ballyhooed "problem" of finding minutes for the starting five taking up much of the attention, less has been paid to the big men and their own potential minutes crunch. 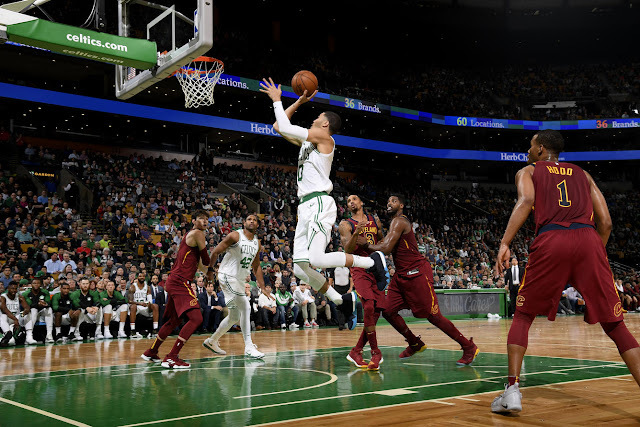 For good reason, perhaps, as the role of the big in today's game has diminished, at least in certain roles, and the star power (excepting Al Horford, and arguably, Jayson Tatum) lies mostly on the wing and back court on this team. That doesn't make the potential rotations of the four and five any clearer, though, as even the starting lineup isn't certain with Gordon Hayward looking like he'll need some time to round into form. Presumably, the starting unit most desired by Brad Stevens and company would see Horford at center, and Tatum at the four to wreak havoc against a multiplicity of lineups, retaining Aron Baynes to defend against slower, less mobile second units and the occasional dinosaur team. After that, it's wide open. We have Daniel Theis, who showed much promise last year on both ends of the floor, modeling his game on a one Marcus Smart on stilts, coming back from injury, and another Marcus (Morris) in a contract year where he'll need to balance role acceptance with showcasing what he can do when he is playing. Guerschon Yabusele is in a likely make-or-break year to stick with the team, and it is looking like Robert Williams might just force himself into some meaningful playing time sooner than later, with defensive skills that would fit seamlessly into Stevens' style of play. There's 96 minutes to fill the front court slots with, and while Boston may be more flexible in terms of how it uses and thinks of players than many teams in the league, it's not very helpful, as the wing is the only place the Cs can say they have more depth (and less minutes) than the bigs. The solution will probably see more Baynes early in the season and in the playoffs, and more Theis and Williams late in the regular season, with the former holding steady into the postseason, and the latter losing time if only for lack of a postseason (or really, any) pedigree. If you nailed me down to trying to guess the minutes at the start of the season, I'd say Al would lead the pack at about 32 minutes per game, and Tatum nearly the same; Aron and Mook around 15, and Theis, Williams, and Yabu competing for about ten more front court minutes between them. You'll note that's more than 96 minutes, as I think at least Jayson and Morris may see a little time as the functional three, but not much given they can play up to the four. By the end of the season, I expect Yabu to be on another team, and Theis or Williams splitting that ten minutes between them, but if any of the lower end of the rotation shows real promise, it could force a move to consolidate some pieces, especially if Semi Ojeleye hasn't taken any steps forward on offense by the trade deadline. There's plenty of other ways this could play out, but for now, this is my best guess. How do you think the frontcourt rotations will look over the course of the season? Let us know in the comments below.